Though pigeons have poor vision in the dark and fly only during the day, artist Duke Riley is attaching LED lights onto the legs of 2,000 of the birds and forcing them into the air at night, potentially subjecting them to stress, disorientation and drowning in the frigid water below. Post a comment on Creative Time’s Facebook page. Tweet the organization that is producing the event, Creative Time, and the artist, Duke Riley. 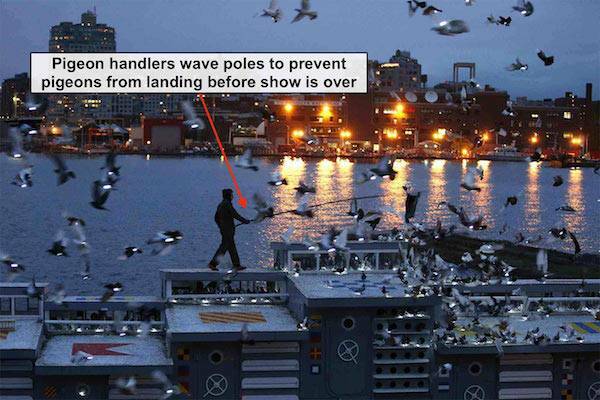 Bird advocates say that the stress of being forced to fly at night is exacerbated by the potentially blinding lights and the pigeon handlers’ use of poles to prevent the frantic birds from landing on the boat from which they are launched. In a NY Times review of the show, Roberta Smith states that “some [pigeons] regularly attempted to return to the boat only to be gently shooed away by their handlers.” During the performance, kayakers hired by Creative Time patrol the river for fallen birds – a tacit acknowledgment that the artist is putting the bird’s in harm’s way. “Taunting pigeons with a long pole? Forcing them to fly at night even though they cannot see in the dark? 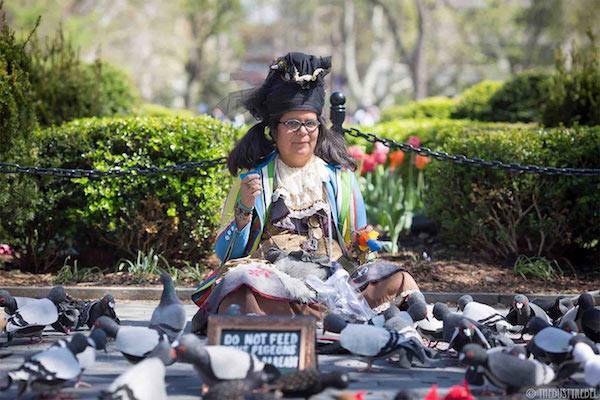 These are unwilling participants, and this is not art; it’s animal cruelty,” said artist Tina Trachtenburg, a NYC-based pigeon advocate who has dedicated her life to being a voice for the oft-marginalized bird. Mr. Riley and Creative Time defend the use of pigeons, asserting that they “retained an avian veterinarian who helped establish proper protocols for the health and safety of keeping pigeons” and that an “independent animal advocacy monitor is on hand for all performances.” Animal rights activists, however, argue that the use of protocols and monitors don’t make the use of the pigeons any less inhumane. “At dusk, these birds would be settled in for the night, not flying into the darkness and not wearing accessories to entertain humans,” said Trachtenberg. A Change.org petition to shut down Fly By Night has collected over 1,000 signatures in two days. 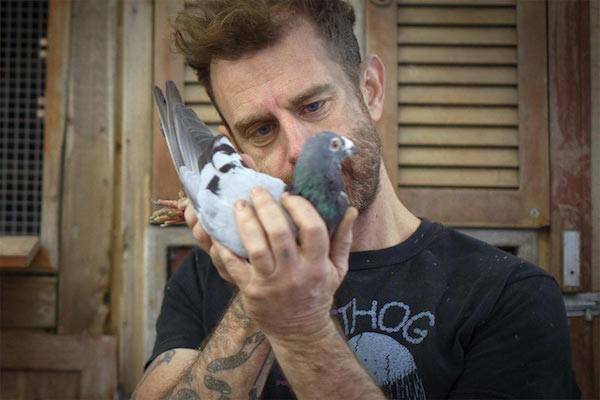 According to Creative Time, the artist will, at the conclusion of the show, “keep many of the pigeons as his pets.” The rest, the organization says, “will be returned to their original owners or be placed with local pigeon fanciers.” Advocates suspect that many of the pigeons will sent to operators of canned hunts. 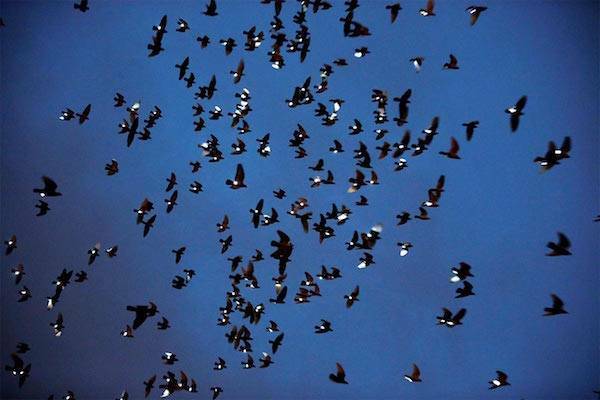 “Fly By Night” is not Mr. Riley’s first art exhibit with pigeons. In 2013, he strapped black market Cuban cigars and cameras onto dozens of pigeons and forced them to fly 100 miles from Havana to Key West, Florida. The NY Times reported that many of the pigeons died or disappeared in Riley’s “Trading with the Enemy” art project.